Doesn’t this just feel like something Microsoft would have done back in the day? I agree that it will probably get brands to send something to Google+ (maybe link their Tweets), but I don’t see this helping make G+ successful. Well. Facebook is helping their cause by locking their own platform from proper indexing by Google and other search engines. They want you to spend more time on Facebook. Google is just using their own platform to promote their own services. Great observation … great analogy to using their windows dominance to sell office. Are you sure this is not some type of ad in connection with Google+? 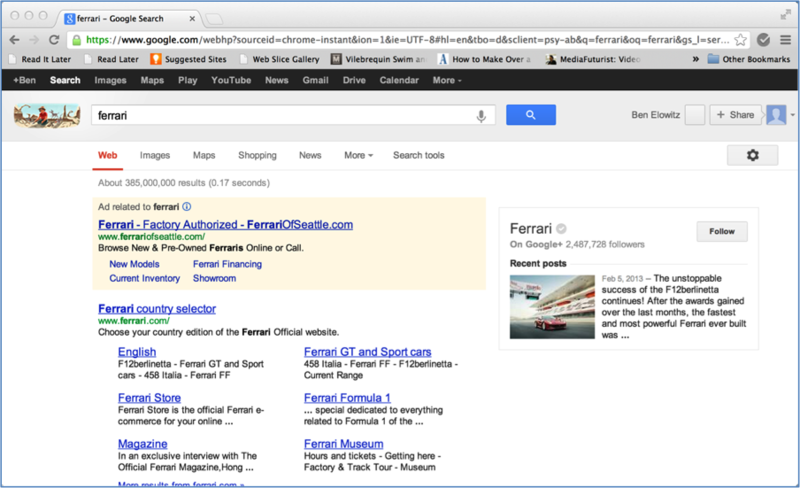 I can’t replicate this with any other brand name of brands that are on Google+…. It works for some brands – it doesn’t yet seem to work for all of them. I don’t know how they choose .